I vaguely recall the restaurants I frequented 15 or 20 years ago, before I had a better understanding of the quintessential dining experience. I wonder if I stopped to take in the small touches that make every eatery unique. I’ve always had a love affair with good food, but there is so much more to restaurants than just good food. Like a friendly face to greet you at the entrance. Decor that is chic, tasteful and at the same time really fashionable. And a view that will keep you coming back, any chance you get. 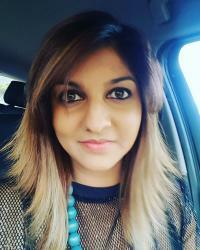 Hospitality is everything in an oversaturated tourist market, and at Bobo’s Brasserie in Mouille Point, you’re guaranteed warm smiles, helpful waiters and none of the awkwardness that comes with it. You’re also guaranteed a great Instagram shot, with the beach as the perfect backdrop to your cocktail. The interior is set in rich tones with dark green chairs and floral wallpaper. This newcomer is already making waves so I suggest you block off an hour or two extra if you really want to indulge in an unhurried French-inspired dinner. The bonus is watching the sky fade from day to night, and the kaleidoscope of colours that accompany it. In 20-mineteen, I plan on trying at least one far left item from every menu. Live a little! I can’t remember the last time I saw snails on the appetizer menu, begging the question, is it not fashionable anymore? I was going to find out. They arrived, in shell, lying in a healthy dose of garlic and butter – with a baguette to scoop it up. If the fanny-pack can make a respectable come-back, then #BringBackSnails to our menus. At R105, and a good portion size, it can be eaten as a light meal, if you’re not in the mood for a full dinner, I suggest asking for an extra piece of bread to mop up the excess sauce. 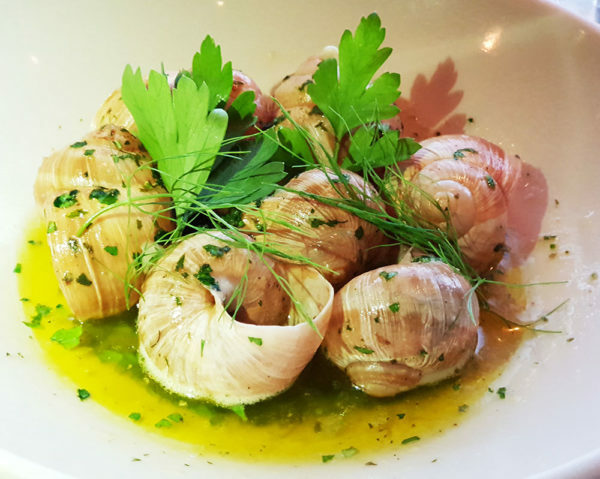 Delicious snails in garlic and butter. Among the other starter options were fresh oysters, yum! French onion soup (R95) and asparagus – which, judging by someone else’s order, should have been mine. See full menu here. In-between leisurely cocktails, please make a point of trying the gin with the litchi twist. I take in my surroundings, and I am really impressed. There is a fine line between too much and way too much, the design element is unusual to say the least. 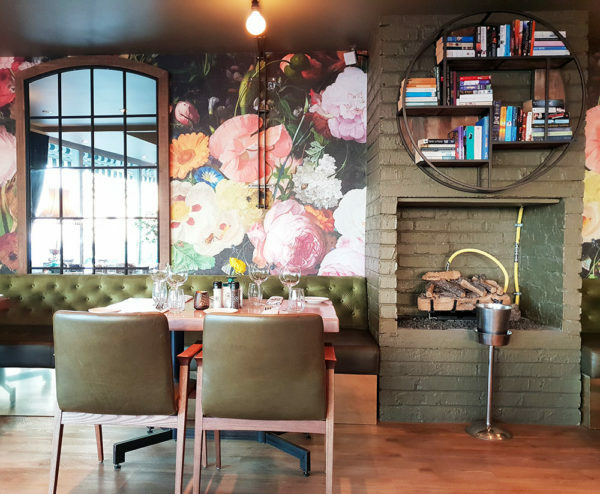 The interior is set in rich tones with dark green chairs and a heavy hand of floral wallpaper, which somehow work harmoniously with the rose gold pendant lights, hanging shelves and unexpected bookcases. The restaurant is also rather spacious, which is also unanticipated, with an open kitchen and bar area. An intimate outside area is perfect for a night out with friends. I would advise you to book in advance. Main meal options range from Bouillabaisse, with fennel, celery, garlic, white mussels, clams, prawns, white fish, rouille and sour dough (R165) to various French steak preparations. Vegetarian options include Parisian dumplings (R145) and Croques (R95). I love that they considered family dining and included a whole roast organic chicken, as well as a steak on the bone, that serves four. I chose to go with the single portion of roast organic chicken with mushroom, onion and potato dauphinoise. It was respectable for one person, and the chicken was delicious. The flavour seeped into the white meat and the skin was very well seasoned. The potatoes were a little under seasoned. The meal was good but it needed a sauce to pull it together to make it great. Chicken is a dry meat, so a good sauce wouldn’t go amiss. Sides and sauces are served separately, so order accordingly. 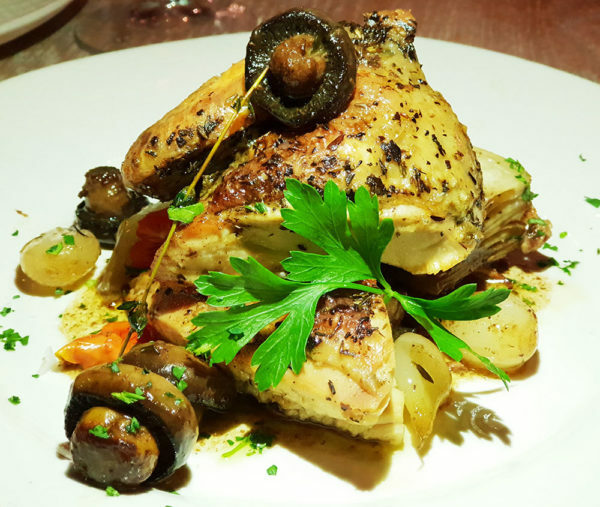 The organic roast chicken with mushrooms. Dessert was a French affair worth skipping your main meals for. 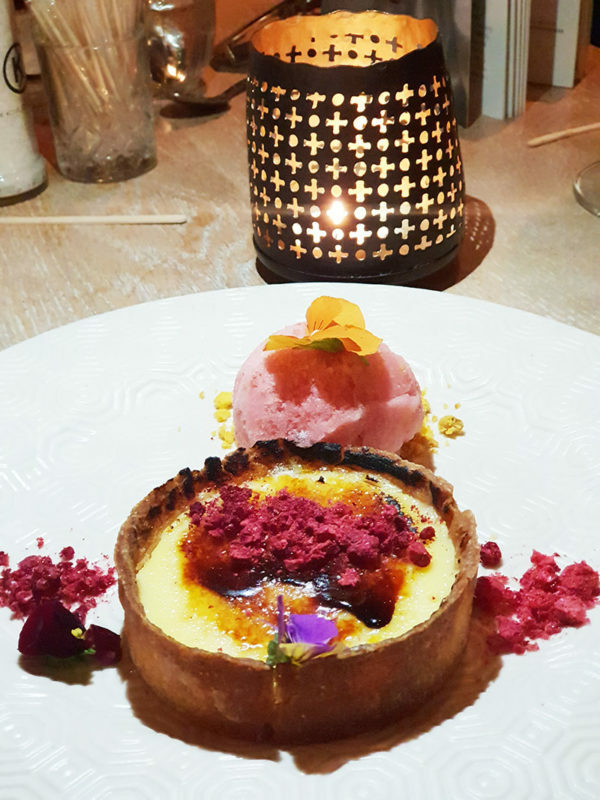 The Crème Brûlée priced at R65 will satisfy the craving, but head straight to the lemon tart with raspberry sorbet if you want to try something a little more adventurous (R95). It is sweet, tangy and truly magnificent. The sorbet texture could have been less rigid, but the lemon tart cut through it. The lemon tart with raspberry sorbet. The experience from start to finish was entertaining, and the location couldn’t possibly get any better. The service was exceptional and the interior enchanting. 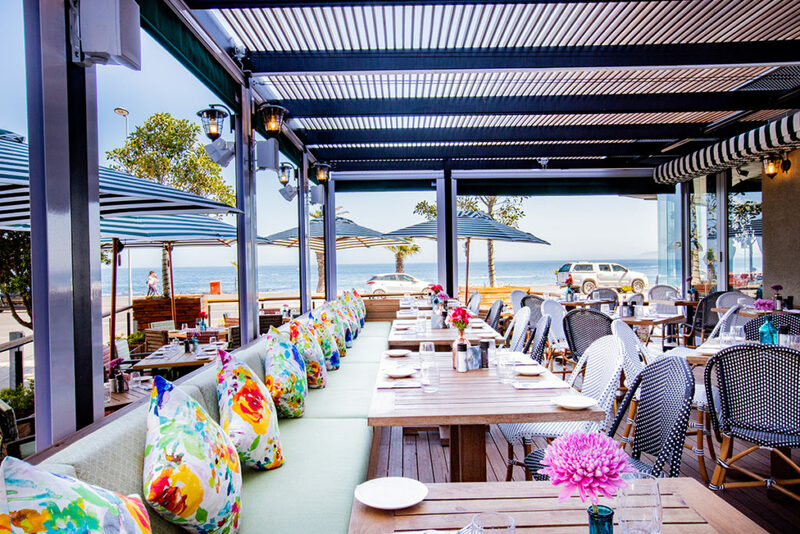 If you’re looking for something different in a sea full of normal, Bobo’s Brasserie is exactly that place.